Physics isn’t the most popular book topic people gravitate towards when looking for a subject worthy of reading. 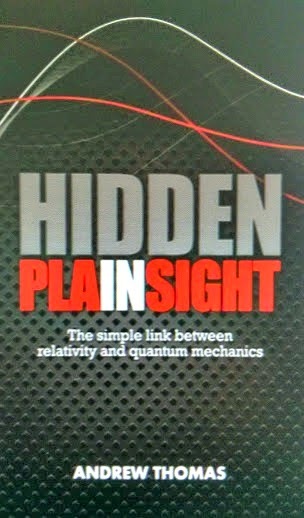 Hidden in Plain Sight by Andrew Thomas provides a broad overview of modern physics. Even though the topics can be quite complex to lay readers this book has simplified the principles so that seemingly complex topics are covered parsimoniously. Two theories have dominated physics for more than a century. General relativity and quantum mechanics have allowed scientists to explore the universe with satellites and has led to new momentum in the space race. The two theories have not been well connected in literature. General relativity explains how objects relate to each other in space as well as the influence of gravitational forces on the movement of those objects. Quantum mechanics helped scientists develop the laser, computers, and other high processing products. It is possible to argue that general relativity is about big things while quantum mechanics looks at little things. Quantum mechanics tells us how particles behave and how they influence each other on a miniscule scale. The problem is that in physics all particles and objects are relatively the same and should be following similar rules. Whether one is looking through a microscope or a telescope the same principles should be at work based upon the type of elements involved. In Quantum mechanics everything in the universe is connected to everything else. They may seem like they are separate but that is not the case. Two particles may work together in unison in a system that develops its own unique attributes. Some objects may have distance between the elements but can still influence each other in a more complex arrangement. As knowledge and research develops people become aware of how elements work together to create the whole. The book will work through concepts such as unification, universe, space, time,quantum reality, observation, rationale and what we can’t see. It provides an overview of the link between relativity and quantum mechanics by leading readers through present knowledge. Thomas, A. (2012) Hidden in Plain Sight: The simple link between relativity and quantum mechanics. [Kindle Edition].